Our No Stress SCUBA Diving trips every day of the week to every part of the reef from Carysfort to Pickles reef. If the dive site is not on this list then please call or email us to request a different site. Our policy is that first person to book on the boat gets the choice of the first dive site! SCUBA Diving Boats leave at 830am and 1pm and return 4 hours later. Each trip is a 2 tank dive and you get 1hr in the water (or 500psi left in tank) for each dive, its about a 40 min ride from our dock shop to the reef. Our Boats are licensed to carry 15 divers however to aid comfort we usually take between 6 and 10 divers on each boat. We do have space for 24 tanks so we are able to take 12 if you have a complete group. Weights are provided on the boat in 2, 3, 4, 5, 6, 7 and 8lb hard weights. We can provide a range of rental equipment packages from masks to computers. Nitrox at 30% for divers that are NITROX certified. SCUBA trips are 2 tank dives and cost $85.38 inc tax for certified divers, the cost include tanks and weights. Whole boat charters for up to 12 people cost $650 for a 2 tank dive and include tanks and weights. Iced water with paper cups, Chips Ahoy cookies, reef friendly sunscreen and leave in conditioner are available FREEE on each trip. 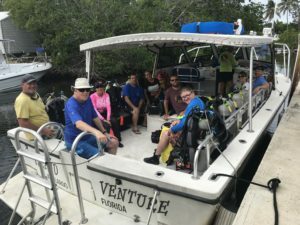 What makes Island Ventures different to other dive shops in Key Largo? Our location is roughly in the middle of the Key Largo reef tract which means its the same distance from Carysfort in the north to Pickles reef in the south so we can go to any location on the reef. Customer satisfaction is our main aim. If we do not believe you will have a good time diving we will tell you and make other suggestions. Our SCUBA trips run with less divers than we are licensed for to ensure there is a high level of comfort on our boats. We continue to run our smaller boats as we believe that the dive experience is better for divers and by putting less divers on 1 part of the reef its better for the reef and you will see more. We have seen what happens when boats put over 20 divers in the water at the same time!